Rising inequalities across the world have become a defining challenge of our time. Unless we take action to reverse this trend, inequalities will further deepen divides, stirring social unrest, undermining social progress and threatening political and economic stability. This could imperil all pillars of the work of the United Nations from development to human rights to peace and security. Development will only be sustainable if it is also more equitable. Joint action is needed now. The implementation of the 2030 Agenda must focus on eliminating discrimination and reducing inequalities if it is to meet its promise to "leave no one behind". This publication therefore aims to establish a common understanding of the challenge of rising inequalities and pervasive discrimination and sets out a United Nations system-wide Shared Framework for Action for a more coordinated and integrated approach to combatting inequalities and discrimination at national, regional and global levels in UN support to the implementation of the Sustainable Development Goals. 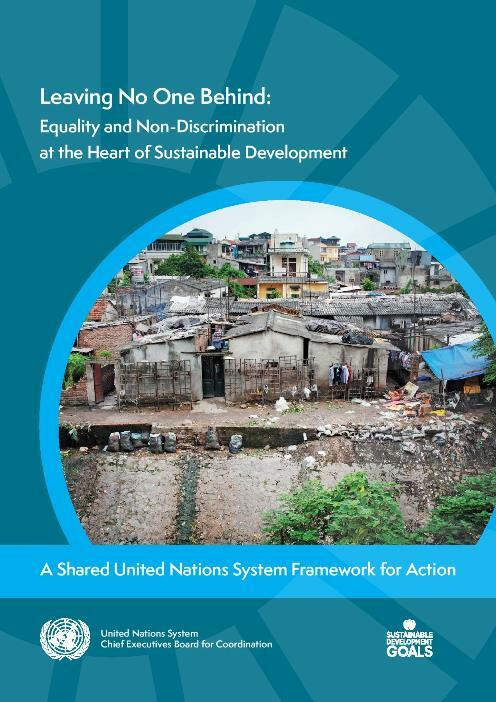 It identifies a comprehensive package of policies and programme support to reduce inequalities and dismantle discrimination; promotes common methodologies and tools for analysis and monitoring that systematically integrate inequalities, discrimination and equity issues in SDG monitoring; and advocates for strengthened accountability for results on reducing inequalities to ensure no one is left behind. With widespread adoption, the Framework will help the organizations of the United Nations system, each utilizing their unique expertise, to work in a more strategic, coordinated and integrated way towards comprehensive and coherent action to combat inequalities at all levels. The Framework was developed by the High-level Committee on Programmes (HLCP) of the UN System Chief Executives Board for Coordination (CEB) through a time-bound working group established as an inter-agency Consultative Group on Inequalities under the leadership of the Office of the United Nations High Commissioner for Human Rights (OHCHR) and the United Nations Entity for Gender Equality and Empowerment of Women (UN Women). The Framework was approved by HLCP at its 32nd session in October 2016 and endorsed by CEB in November 2016.